The Tokyo Stock Exchange (東京証券取引所, Tōkyō Shōken Torihikijo), which is called Tōshō (東証) or TSE/TYO for short, is a stock exchange located in Tokyo, Japan. It is the fourth largest stock exchange in the world by aggregate market capitalization of its listed companies, and largest in Asia. It had 2,292 listed companies with a combined market capitalization of US$4.09 trillion as of April 2015. In July 2012, a planned merger with the Osaka Securities Exchange was approved by the Japan Fair Trade Commission. The resulting entity, the Japan Exchange Group (JPX) (日本取引所グループ, Nihon Torihikijo Gurūpu), was launched on January 1, 2013. The TSE is incorporated as a kabushiki gaisha with nine directors, four auditors and eight executive officers. Its headquarters are located at 2-1 Nihonbashi-Kabutochō, Chūō, Tokyo which is the largest financial district in Japan. Its operating hours are from 8:00 to 11:30 a.m., and from 12:30 to 5:00 p.m. From April 24, 2006, the afternoon trading session started at its usual time of 12:30 p.m..
Stocks listed on the TSE are separated into the First Section for large companies, the Second Section for mid-sized companies, and the Mothers (Market of the high-growth and emerging stocks) (ja:マザーズ) section for high-growth startup companies. As of October 31, 2010, there are 1,675 First Section companies, 437 Second Section companies and 182 Mothers companies. The main indices tracking the TSE are the Nikkei 225 index of companies selected by the Nihon Keizai Shimbun (Japan's largest business newspaper), the TOPIX index based on the share prices of First Section companies, and the J30 index of large industrial companies maintained by Japan's major broadsheet newspapers. The exchange's press club, called the Kabuto Club (兜倶楽部, Kabuto kurabu), which meets on the third floor of the TSE building. Most Kabuto Club members are affiliated with the Nihon Keizai Shimbun, Kyodo News, Jiji Press, or business television broadcasters such as Bloomberg LP and CNBC. The Kabuto Club is generally busiest during April and May, when public companies release their annual accounts. On 15 June 2007, the TSE paid $303 million to acquire a 4.99% stake in Singapore Exchange Ltd. The Tokyo Stock Exchange was established on May 15, 1878, as the Tokyo Kabushiki Torihikijo (東京株式取引所) under the direction of then-Finance Minister Ōkuma Shigenobu and capitalist advocate Shibusawa Eiichi. Trading began on June 1, 1878. 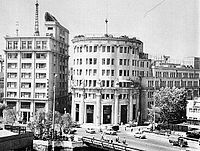 In 1943, the exchange was combined with ten other stock exchanges in major Japanese cities to form a single Japanese Stock Exchange (日本証券取引所, Nippon Shōken Torihikisho). The combined exchange was shut down and reorganized shortly after the bombing of Nagasaki. 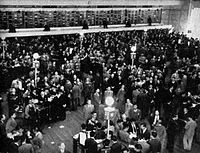 The Tokyo Stock Exchange reopened under its current Japanese name on May 16, 1949, pursuant to the new Securities Exchange Act. The TSE runup from 1983 to 1990 was unprecedented, in 1990 it accounted for over 60% of the world's stock market capitalization (by far the world's largest) before falling precipitously in value and rank one of the 4th largest exchange in the world by market capitalization of listed shares. The current TSE building was opened on May 23, 1988, replacing the original TSE building from 1931, and the trading floor of the TSE was closed on April 30, 1999, so that the exchange could switch to electronic trading for all transactions. A new facility, called TSE Arrows (東証アローズ, Tōshō Arrows), opened on May 9, 2000. In 2010, the TSE launched its Arrowhead trading facility. In 2001, the TSE restructured itself as a kabushiki gaisha ("stock company"): before this time, it was structured as an incorporated association (社団法人, shadan hōjin) with its members as shareholders. The exchange was only able to operate for 90 minutes on November 1, 2005, due to bugs with a newly installed transactions system, developed by Fujitsu, which was supposed to help cope with higher trading volumes. The interruption in trading was the worst in the history of the exchange. Trading was suspended for four-and-a-half hours. During the initial public offering of advertising giant Dentsu, in December 2001, a trader at UBS Warburg, the Swiss investment bank, sent an order to sell 610,000 shares in this company at ¥1 each, while he intended to sell 1 share at ¥610,000. The bank lost £71 million. During yet another initial public offering, that of J-Com, on December 8, 2005, an employee at Mizuho Securities Co., Ltd. mistakenly typed an order to sell 600,000 shares at ¥1, instead of an order to sell 1 share at ¥600,000. Mizuho failed to catch the error; the Tokyo Stock Exchange initially blocked attempts to cancel the order, resulting in a net loss of US$347 million to be shared between the exchange and Mizuho. Both companies are now trying to deal with their troubles: lack of error checking, lack of safeguards, lack of reliability, lack of transparency, lack of testing, loss of confidence, and loss of profits. On 11 December, the TSE acknowledged that its system was at fault in the Mizuho trade. On 21 December, Takuo Tsurushima, chief executive of the TSE, and two other senior executives resigned over the Mizuho affair. On January 17, 2006, the Nikkei 225 fell 2.8%, its fastest drop in nine months, as investors sold stocks across the board in the wake of a raid by prosecutors on internet company livedoor. The Tokyo Stock Exchange closed early on January 18 due to the trade volume threatening to exceed the exchange's computer system's capacity of 4.5 million trades per day. This was called the "livedoor shock". The exchange quickly increased its order capacity to five million trades a day. The exchange's normal trading sessions are from 9:00 a.m. to 11:30 a.m. and from 12:30 p.m. to 3:00 p.m. on all days of the week except Saturdays, Sundays and holidays declared by the Exchange in advance. The exchange is closed for the following holidays: New Year's Day, Coming of Age Day, National Foundation Day, Vernal Equinox Day, Shōwa Day, Constitution Memorial Day, Greenery Day, Children's Day, Marine Day, Respect for the Aged Day, Autumnal Equinox, Health and Sports Day, Culture Day, Labour Thanksgiving Day, and The Emperor's Birthday. Corporate shares are listed and traded at Tokyo Stock Exchange in several sections: the First Section which started when Tokyo Stock Exchange was re-established in 1949 and includes mainly large companies; the Second Section which started in 1961 and includes mainly mid-sized companies; JASDAQ (established in 1991, acquired by Osaka Stock Exchange in 2010, and absorbed into TSE in 2013) and Mothers (Market of the high-growth and emerging stocks, in Japanese: マザーズ, established at TSE in 1999) which are both for emerging companies; and TOKYO PRO Market (in Japanese: TOKYO PRO Market) which was established in 2009 jointly with London Stock Exchange as an AIM. There are also active bond market and futures market. The London Stock Exchange (LSE) and the TSE are developing jointly traded products and share technology, marking the latest cross-border deal among bourses as international competition heats up. In July 2008, the London Stock Exchange (LSE) and the TSE announced a new joint venture Tokyo-based market, which will be based on the LSE's Alternative Investment Market (AIM). ^ "Japan's Tokyo Stock Exchange is the second largest stock market with a market value of $3.3 trillion". The Economic Times. June 19, 2010. Retrieved 19 Jun 2010. ^ "Japan approves merger of Tokyo and Osaka exchanges". BBC News. July 5, 2012. Archived from the original on July 7, 2012. Retrieved July 7, 2012. ^ Yasu, Mariko (2007-06-15). "Tokyo Stock Exchange Buys 4.99% of Singapore Exchange (Update2)". Bloomberg. Retrieved 2010-07-10. ^ "What's Going on at the Tokyo Stock Exchange - Seeking Alpha". Japan.seekingalpha.com. Retrieved 2010-07-10. ^ "archives". Taipei Times. 2005-12-10. Retrieved 2010-07-31. ^ "Tokyo Stock Exchange plans cash settlement in Mizuho fiasco - report". Forbes.com. November 12, 2005. Retrieved 2010-07-10. ^ "Botched stock trade costs Japan firm $225M - Business - World business - msnbc.com". MSNBC. 2005-12-14. Retrieved 2010-07-10. ^ Ku, Daisy (July 29, 2008). "London bourse outlines framework for Tokyo JV | Reuters". Uk.reuters.com. Retrieved 2010-07-10. Wikimedia Commons has media related to Tokyo Stock Exchange.